Friend: Help, I need one more person to sign up for a weekend intensive playwriting class. Please let it be you! Me: I'm a novelist, not a playwright. I need backstory, exposition, and sentence structure. Friend: How important is great dialogue and rising action to your story? I took a deep breath and signed up. Entirely out of my element, I felt like Larry The Cable Guy at a cotillion. I didn't know the latest Broadway debut. I couldn't laugh about The Tony Awards. I did have a pivotal scene in my novel that was less than mesmerizing, so I decided I would challenge myself and put playwriting to the test. We covered staging, what to include off-stage versus on-stage, information the audience must know versus what can be inferred. I took detailed notes on integrating action into dialogue and how to ramp up the tension. We covered controlling the pacing so by the apex of a scene the audience would grip the armrests of their uncomfortable chairs. And then she gave us four hours to write. I knew the purpose of my scene in the overall plot. I wasn't sure of the setting, or how my two characters would arrive at the denouement. A memory of a trip I took in my childhood struck me. At a motel in the Smoky Mountains, my parents stayed in one room while my sister and I stayed in another. On a trip to the vending machine, five enormous and aggressive raccoons tried to jump us. We spent the rest of the night terrifying ourselves with the idea they would infect us with a rogue rabies virus and turn us into zombies. We felt trapped. Don't Kid Yourselves. They Have Opposable Thumbs. Without overthinking it, I trapped my characters in the same way. So I wrote a scene for the stage—two sisters, one a drug addict who was high on heroin and the other sister terrified that her beloved sister would die and was ready for a long-delayed confrontation. No getting inside my point of view character’s head, no reverting to the backstory, just raw emotion, piercing dialogue, and dramatic stage action. Then the most amazing thing happened. As part of the workshop, professional actors took my scene and performed it on stage. 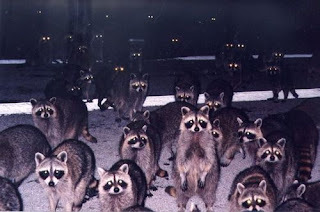 My three-page raccoon scene came to life. It was good. It worked. I cried. I took that scene home with me and converted what I needed to so it would fit into my novel, and it has remained one of my beta readers’ favorite episodes in the story. One: I would absolutely read a story about rabid raccoons, a rogue rabies virus, and the subsequent transition of vending-machine-seeking young girls into zombies. I also can think of several publications that would snap that story up in the space of small, leathery hands with opposable thumbs. Two: By the dialogue you showed us between you and your award-winning playwright friend, I can tell you've got the Right Stuff. It was a succinct and efficient conversation via text. I'd be interested to know if our modern tendency toward texting lends us some intrinsic screenwriting skills? Simply a wild theory, based on nothing other than speculation. Nonetheless, it could be an intriguing aspect to a screenwriting class. Three: I'm extremely glad that we have Trai Cartwright as a magnificent resource in our community. She'll be teaching two classes at the NCW conference--"Considering Character" and "I, You, Them: How Perspective Empowers Your Story." Trai will be offering a screenwriting-specific conference in Denver on August 4. Useful article, Eleanor. Thank you!